- VOICE CONTROLLED. Works with Amazon Alexa, Google Home and Samsung SmartThings when combined with a Hue bridge. Smart lighting Alexa: can be connected to the Amazon Echo Plus directly; the Amazon Echo Dot, Echo, Echo Show and Echo Spot require a bridge like Phillips Hue to control the light by Alexa or the Alexa app. - REPLACE HALOGEN SPOTS. Perfect Fit for your recessed spotlights with a GU10 socket. The smart LED variant of the classic halogen spotlight. - PREMIUM LIGHT QUALITY. Beautiful warm white LED light with a 36° beam. 2700K with natural colour rendering. - SAVE ENERGY. 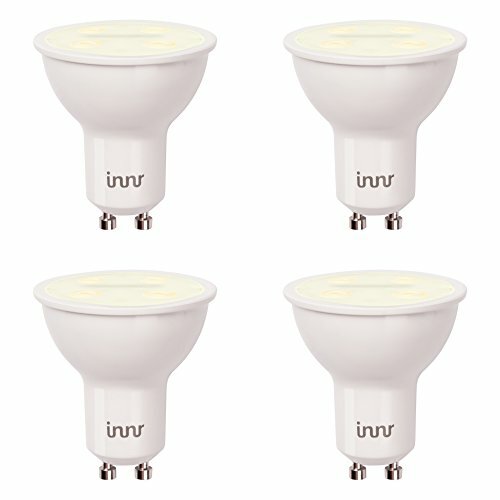 Innr bulbs use up to 80% less energy than traditional light bulbs.